Surface currents that exist in the Gulf of Mexico - you can clearly see the loop current and the Gulf stream, two mesoscale currents that are prevalent in the Gulf. Image courtesy of NASA/Goddard Space Flight Center Scientific Visualization Studio. Throughout the world's oceans, particles can sink from the upper layer of the ocean to the deep ocean, reaching significant depths before being degraded. These particles are made up of various inorganic and organic materials, including particulate organic carbon (POC), and influence the local marine ecosystem and global ocean’s carbon cycle by ‘moving’ carbon across the water column to depths where it can be buried or used by bacteria. In most cases, the carbon that reaches the ocean bottom is removed permanently from the atmosphere. The Gulf of Mexico in particular is a highly productive region with very large amounts of sinking particles. ECOGIG researchers have placed sediment traps near the bottom of the Gulf to capture and measure the amounts of these settling particles - however, the data collected reveals a large variability that cannot be easily explained considering only the the traps’ location. ECOGIG PhD student Guangpeng Liu and PI's Drs. Annalisa Bracco and Uta Passow recently published an article in the journal Elementa that looks at the role the strong currents that exist in the Gulf of Mexico might play in particle transport. The Gulf is a basin with energetic mesoscale (large currents such as the the Loop Current, its detached Loop Eddies, smaller cyclones; scales 10-200 km) and submesoscale (small eddies, vorticity filaments, fronts; scales 0.1-10 km) currents. They hypothesized in this research that these currents may impact the transport of sinking particles in the Gulf. The researchers were able to use numerical simulations performed with an ocean model to investigate what causes the variability in the trap data. The model results and trap data showed that cross-shore transport of riverine input induced by large scale currents, and processes at the scale of a few kilometers, significantly impacted where particles sinking to the bottom in the Gulf of Mexico originate, when formed at the surface. This study also confirms that vertical movement of particles is highly variable in both space and time in the presence of an energetic eddy field, especially for particles with sinking velocities of 50 m/day or less. Their results also indicated that a lot of particles sink to the bottom much faster than predicted by the sinking speed alone. This is associated with the presence of strong convergence in the oceanic mixed-layer. 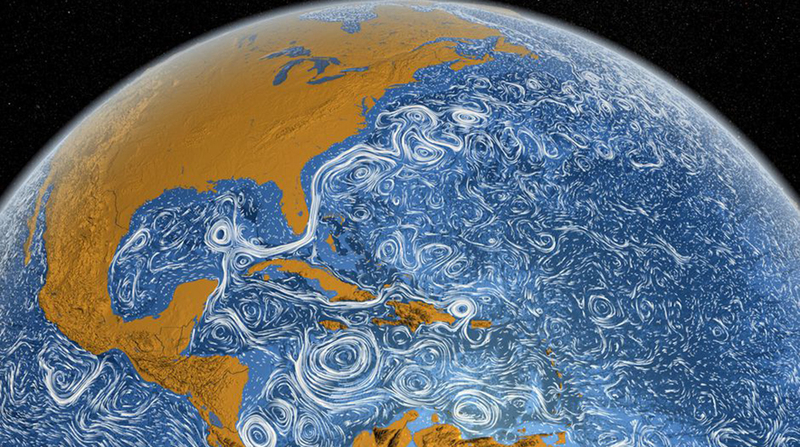 The ocean currents quite literally take the carbon particles to the ocean bottom. ECOGIG researchers hope that, in the future, these results will contribute to interpreting the variability of data from deep traps in other parts of the world. It is rare to be able to measure particle fluxes for as long as ECOGIG researchers have, and with traps located so close together. At the same time, the faster sinking rates they discovered in the model simulations opens up the possibility to develop physically based parameterizations for carbon (POC) sinking in ocean models that account for it. This topic is particularly relevant given the increase in greenhouse gas emissions by anthropogenic sources to the atmosphere and the key role played by the ocean in absorbing part of atmospheric CO2.